Zach Williams had a successful day at Bigwell fishery. With cold winds at the start of the week, anglers were pleasantly surprised at how well the pools were fishing. The fish are still rising to the dry fly, always an exciting way to fish. For those who like fishing the float or dry fly on top with a dropper, Egg flies, Buzzers, Diawl Bachs etc were tempt-ing fish. For those of you who like to pull the lure, Damsels Montanas, Spiders, Chamois and Squirmy Wormies and Apps’ Bloodworm fished ei-ther fast, slow or static have been successful. Mike Bowen took 3 fish on his catch and kill ticket, while son Matt had 6 on his catch and release ticket. Andy Rawlings took 3 on catch and kill, Adam Meek 3 and Steve Meek 1. Lana Crump from Southampton, on her first fly-fishing trip, caught 3, Philip Drake 2, and George Parfitt 5. 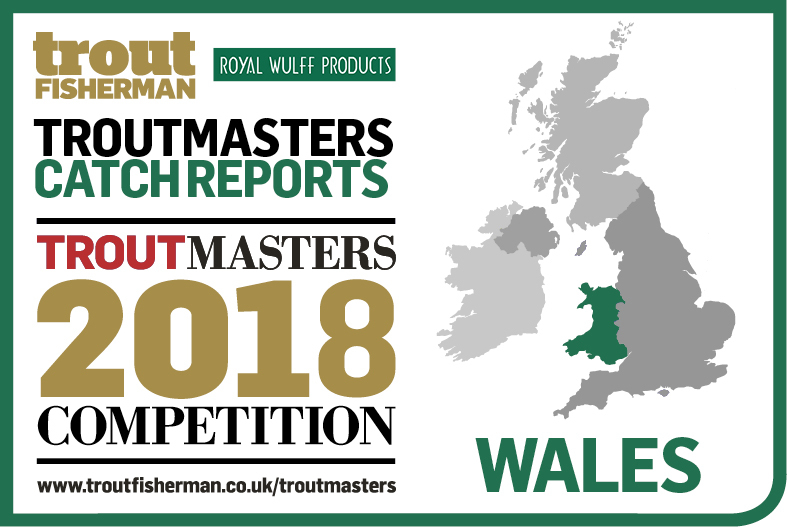 Catching their bag limits this week were Dave Glover, Fred Wood, Mike Shuttleworth, John Burton, Ricky Smith, Duane Shuttleworth 7, Tony Talbot landed 8 mostly using a Chamois fly, George Dickman caught 5, Graham Davies 3. Fish have been taking a variety of small flies all week including Crunchers, Black Gnats, Buzzers, dark Egg flies and Diawl Bachs. Adam Price Hunt landed 8 fish on catch and release including a 4lb 8oz rainbow which we have entered into Troutmasters. 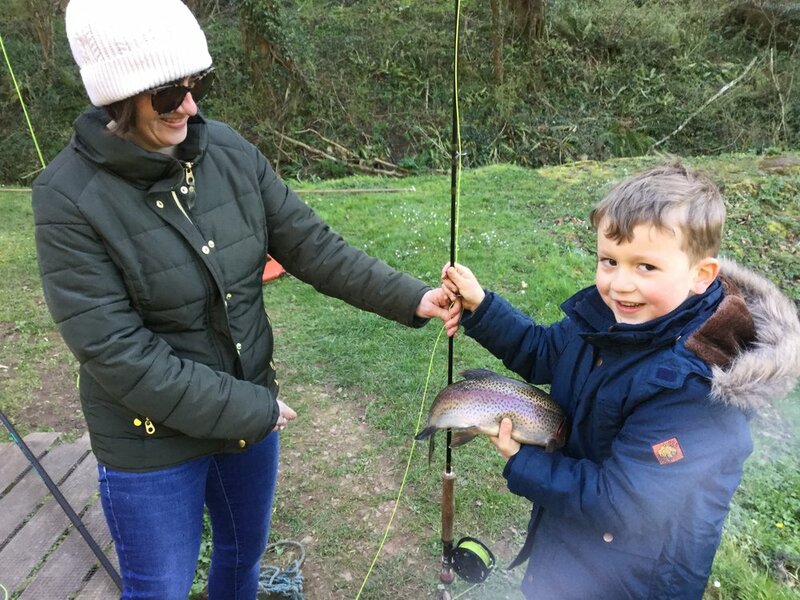 Zach Williams, aged 12, is new to fly-fishing and on his second trip to Bigwell caught and landed 2 beautiful rainbows. Fishery is open every day from 7.30am. Lodge pools have been slightly coloured all week from the fast moving stream but this has not affected the fishing. Top pool and Gin pool remain crystal clear as they are spring-fed only and have fished well. Ben and Shell Andrews were amazed when they caught simultaneously, both on Red Spiders from the Lower Lodge pool. 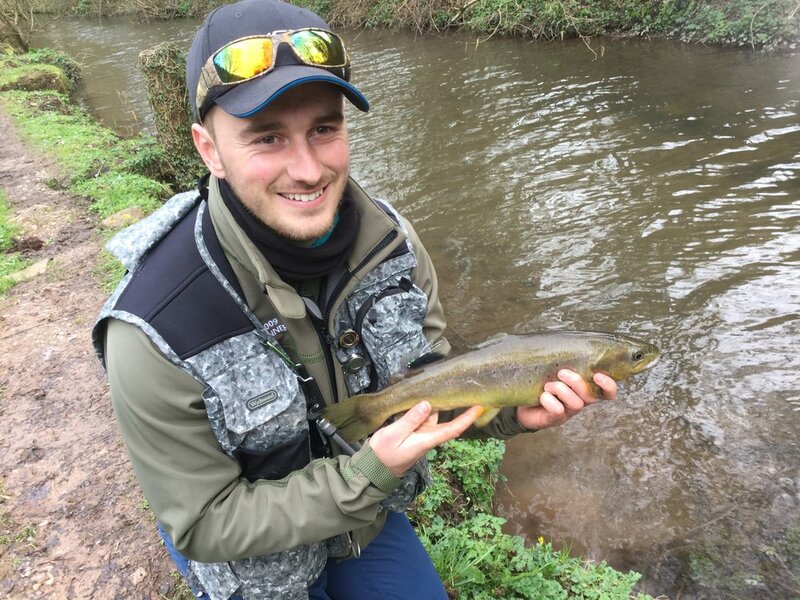 Lionel Davies was delighted to catch a tag fish that won him £200. Hughie Wilson landed a beautiful 6lb 8oz rainbow taken on a White Minkie, also from the Lower Lodge pool. Mick Fahy took 4 and returned 6 from across all pools, mostly on Blue-flash Damsels and small Black Gnats. Rob Britten arrived at 7.15am ready for gates open at 7.30am and bagged up his 4 fish by 8.30am, all taken on a small black nymph. Phil Rees and Graham Jeremiah took 3 fish each on catch and kill, Andrew Williams took 3, Phil Roe landed 3, Basil Freeman 2, Hugo Evans 2, Andy Rawlings 4, David Payne caught 7 including a 10lb blue trout which he caught on a F-Fly which has been entered into Troutmasters competition. 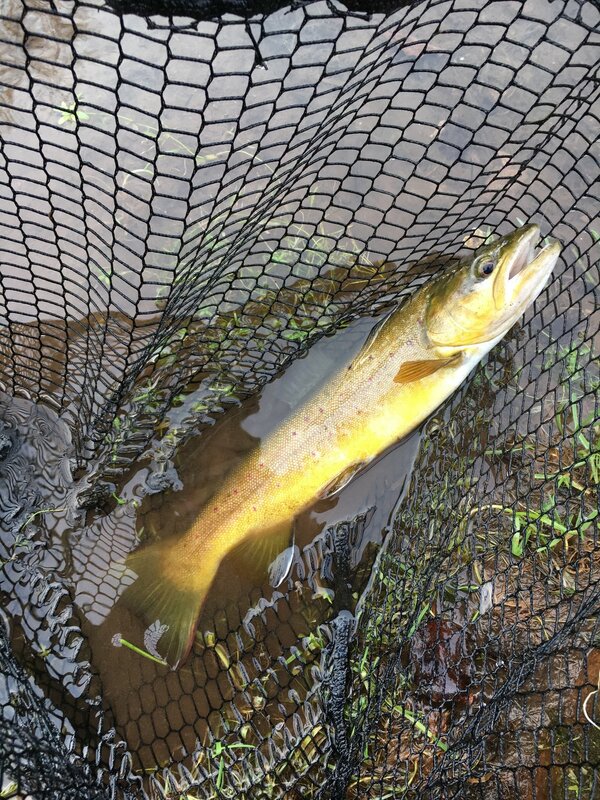 There is still some good dry fly activity at some point throughout the day with anglers catching on Sedge, Klinkhamer, Diawl Bachs and Hoppers. Other popular flies this week have been White Minkies, Red Spiders, Black Daddies, Squirmy Wormies, Blue-flash Damsels, small Black Gnats and Egg flies. Fishing was a little hard going with the frosty starts, but for those that did catch there were some excellent returns. There has been plenty of insect activity during the afternoons so dry fly has been effective, espe-cially Klinkhamers, Deer Hair Sedge, Suspender Buzzer, small gnats and F-Fly. John Moore landed 9 trout including 3 blues; the blues seemed to favour John’s home-tied Green Damsel. His heaviest fish has been entered into this month’s Troutmasters competition. David Harris from Newport had success with his Daddy Longlegs pattern which, at this time of the year, is perfect for Bigwell, especially in the clear waters of the gin pool. David caught 6 fish on his catch and kill ticket including 2 blues and a tiger trout which was returned. On catch and kill this week Basil Freeman landed his 3 fish all on a Green Dam-sel. Keith Fenton had 6, Mike Dobson 3, Karl Williams 5, Steve Philips 3, Mark Lewis landed 4 including a tiger trout which was returned. Ste-ve Webb landed 7. Mark Beacham landed 9 fish, his heaviest a 10lb 4oz rainbow taken on a Damsel, and also entered into Troutmasters. He also had a blue around 7lb. David Challenger also had a nice blue around the same weight and landed 9 others. Stephen Webb caught 7 trout in the lower lodge pool. Nigel Garrett took 1 and released 3 on his catch, kill and release ticket, Mark Blackham took 1 and released 4, Scott Orritt 2, Keith Fenton 6, Lyndon Lillie 5, Chad McDonald 4, Phil Roe 5 on Black Tadpoles and F-Fly. Mick Paine 2, John Burton 10. Popular flies have been Green Damsels, Egg flies, Squirmy Wormies, GRHE and Buzzers. Open every day from 7.30am. Despite the frosty starts each morning it’s been a great week’s fishing es-pecially for Ben Andrews who caught another tagged fish on a Green Spi-der and won himself the £200 pot. This week it has been nice to see fa-thers and sons fishing together and even 3 generations of fly-fishers – Steven Harding, son Scott and grandson James. James landed 4 fish, grandad Steven caught 2 but much to the amusement of the others Scott managed to blank. Father and son David and Jordan Hill landed 3 each. Tomas-Jon Morgan, aged 7 from Merthyr Tydfil, fishing for the first time, caught his first fish on a Cat’s Whisker. Peter Baylis landed 3, Phil Roe 5, Colin Gooch 7, Harry Webb 2, Dennis Millward 5, Graham Jeremiah 2, Phil Rees 4, John Burton 10, Steven Jones 5, Dave Glover 5, Fred Wood 7, Brian Sisson 5, Paul Barnfield 10, Hughie Wilson 10, Rob Britten 3, Graham Alford 3, George Parfitt 5, Ed Hiscocks 1, John Godfrey 1. Popu-lar flies this week have been Cat’s Whiskers, Green Damsels, Green Spi-ders, Black Buzzers, Black Gnats, Klinkhamers and Deer Hair Sedge. Open every day at 7.30am. Over the last several weeks fishing has been quite stable and consistent. The fish were more challenging in the morning taking the usual popular lures, whereas in the afternoon they have taken very aggressively off the top of the water with dry flies. 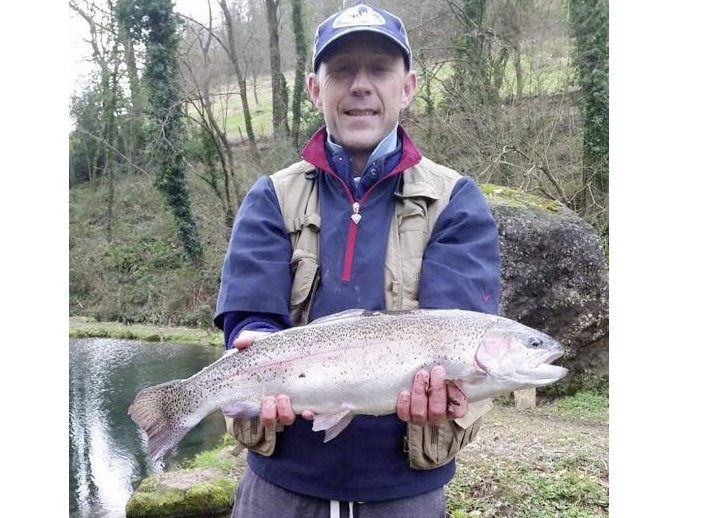 Steve Fletcher, a member of the Hook, Line and Sinker club, caught a 6lb 8oz rainbow on a Cat’s Whisker. On catch and release this week and catching their bag limits were Mick Smith, Carl Williams, Hughie Wilson, Nigel Salter, John Burton, Steven Palmer and Andrew Williams. On catch and kill tickets were John Howell with 4, Hugo Price 2, Andrew Millins 5, Tony Pritchard 3, Terry Hall 5, John Lyall 4, Dave Reaney 1. A great fishing day for Grant Challenger who landed 6 fish for a bag weight of 19lb 8oz and Ron Baker who took 4 weighing 9lb 4oz in total. All pools continue to fish well with our stock of blues, browns, rainbows and tigers ranging from 2lb up to 15lb. 86 year old Gordon Russel and friend Robert Byng from Bromsgrove enjoyed their day at Bigwell fishery. The past week has seen some very good fishing with lots full bags on catch and release (10 fish) and plenty taken for the table too. The weather has been not bad on the whole and there has been plenty of insect activity. Trout have been feeding at or near the surface or within the couple of feet of water. Dry flies have provided some excellent sport for those who like to target fish. Successful flies continue to be a mixed bag of wets, lures and dries, including nymphs, Buzzers, Egg flies, Chamois’, Spiders and Klinkhamers. Surprisingly not much show of daddies as yet. The pools are in very good form in terms of water clarity. While the flow of well water has been pretty slight at times, nevertheless the pools have remained clear, cool and eminently fishable. The Gin pool and lower Lodge pool have had much weed removed this past week and it is hoped that growth will be restricted with cooler conditions and more rain with autumn arriving. Footfall has seen 60 anglers this week taking 257 trout including tigers, giving a rod average of 4+ fish (all ticket types). Sunday saw a distinct lack of clients with the intrepid Dan Mosely having the entire 4 pools to himself! On Tuesday Paul Barnfield arrived with Brian Sissons for their weekly sport. First cast into lower Lodge pool for Paul brought him his first trout and a very nice fish of 4-5lb. Even better was the trout was a ‘tag’ fish which won Paul £200. Paul went on to take 5 fish in total while fishing buddy Brian had to make do with a very small perch!